XDrum Fell 15 cm für Darbuka. Hochwertiges Fell für Darbuka! Ersatzfell für XDrum Oriental Series Darbuka. Ersatzfell für XDrum 15 cm Darbuka! Gewicht: ca. 26 g. Wir sind Ihre Experten! Spezialist für Musikerbedarf seit 1987. VD EGYPTIAN DARBUKA TOMTOM DOUMBEK. Istanbul - TURKEY. Item location. "Brown Earth" Solo Clay Darbuka Doumbek with White Goat Skin. Solo Darbuka 21,5cm skin , 41cm height ,goat skin. protective soft Bag. This is a Beautiful New 19" Gawharet El Fan Dohola darbuka. This large drum is a top quality Egyptian drum. 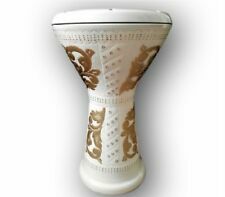 This Beautiful Dohola Egyptian Darbuka has the perfect sound. This GEF Dohola Darbuka is very rare and hard to find because of its relatively large size. Fait de caches en aluminium de haute qualité avec belle mère véritable nacre. MPN Does Not Apply. Diamètre de tête peau - 8,75 cm. Diamètre bas - 7.5 » (1 8,75 cm). Tête de diamètre - 10,5 » ( 26,25 cm). Atlas plaine darbouka, chef 20cm. Prenez moderne sur ce tambour antique. Poids : 1 kg (approx). Item ID : GR17065 N° de modèle : AP-M140. • fût en laiton gravé à la main, peau naturelle. It is light weight but powerful and effective. It provides a wide range from low bass tones to high pitched articulate tones. Rockem Music accepts no responsibility for claims made after 48 hours. A cymbal will not be replaced if it has been: misplayed,used with improper sticks, dropped, played with excessive force or treated abusively; bought second hand or used in a lease program. Type Darbuka. Tambour de qualité supérieure, avec une belle incrustation de nacre véritable dans une conception très traditionnelle égyptienne. C’est une belle nouvelle 17" darbouka, qui comprend un extra clair peau synthétique et un étui premium. The "Green Star" Gawharet El Fan & ZAZA Percussion Joint Vrnture New Generation 2.0 Doumbek. 1 extra synthetic head included. That does not affect the sound or quality of the drum. Covered with real mother of pearl that reflects the spectral colors. El derbeke 22D es ideal para acompañar música oriental. Viene equipado con un parche de cuero artificial (vinilo) fuerte y de sencillo cuidado. Serie Oriental de XDrum - Derbake 22D de piel artificial. The 18.5" Gawharet El Sombaty Darbuka Doumbek Drum - "Black Flower" With Real Green Mother of Pearl. This is a beautiful new 18.5" Egyptian Sombaty New Generation drum, with an extra clear synthetic skin and a premium padded case. The 18.5" Gawharet El Sombaty Darbuka Doumbek Drum - "Magic Garden" With Real Blue Mother of Pearl. This is a beautiful new 18.5" Egyptian Sombaty New Generation drum, with an extra clear synthetic skin and a premium padded case. This is a beautiful new 18.5" sombaty. Sombaty GEF drums are bigger and higher then the regular GEF Classic drums. Weight of the darbuka is around: 5.7Kg. 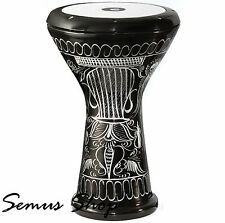 If you are looking for a real Professional Egyptian Darbuka with the highest quality this is the one! Zaza Percussion - The 17" Crocodile Leather Finish Aluminum Darbuka Doumbek, Synthetic Head. 6 bolts head drum Aluminum body Leather coating. (not real Leather) Tuning tool. Its body is made out of Aluminuml & it has a synthetic head Tuner Switch / Allen. Weighs about 6 Kg. That does not affect the sound or quality of the drum. Open the harness and loop it around the base of the doumbek. Now loosen one tuning lug and place the small loop rope between the drum and shell of counter hoop. Make sure loop rope is centered over the lug hole. Fabriqué en aluminium. La coquille est texturée avec des anneaux parallèles donnant la coquille un rayé look, d'où le nom de zèbre. MPN MAZ20J. Comprend : un outil tuning. Orientalische Profi. Da es Naturfell ist kann farblich vom Bild unterscheiden . Innenliegendes Spannsystem mit 10 Spannschrauben. They feature fat lows and ringing highs with a wide sound range in between. Rockem Music accepts no responsibility for claims made after 48 hours. A cymbal will not be replaced if it has been: misplayed,used with improper sticks, dropped, played with excessive force or treated abusively; bought second hand or used in a lease program. This is a professional Small beautiful new 17" Gawharet El Fan darbuka. This drum is a top quality drum! This Egyptian Gawharet El Fan drum is an authentic classic designed darbuka. 1 Power Beat Drum Head. Zaza Percussion 16" Silver Turkish Aluminum Darbuka Doumbek, Synthetic Head and Internal Jingles. 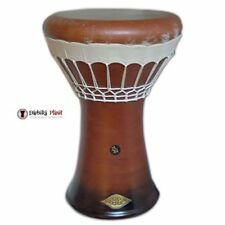 Zaza percussion is a new line of Doumbeks, created with a vision of perfecting the Doumbek sound, and combining it with an uncompromising style and design, high quality materials and most importantly, an affordable price.